Years ago as I strolled through a multitude of churches in Europe I noticed one common theme. It did not matter what city or country. The story was the same. I wondered why no one was properly caring for the lost treasures. Cecilia Giménez also had the same thought as she gazed at a dilapidated fresco of Jesus at the church of Santuario de Misericordia in Borja, Spain. The Ecce Homo fresco, painted in the 19th century, is the only known remaining work of Spanish artist Elias Garcia Martinez. Ceclia was quite bothered by the flaking paint, and the 81 year old volunteer decided to “touch up” the work herself. Here are the before and after shots. How do you think she did? After scrubbing the fresco and applying a fresh coat of paint the image is beyond recognition. The face of Jesus has been replaced with a childlike version of a monkey or alien. 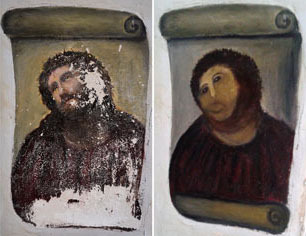 It has been dubbed the worst restoration job in history. 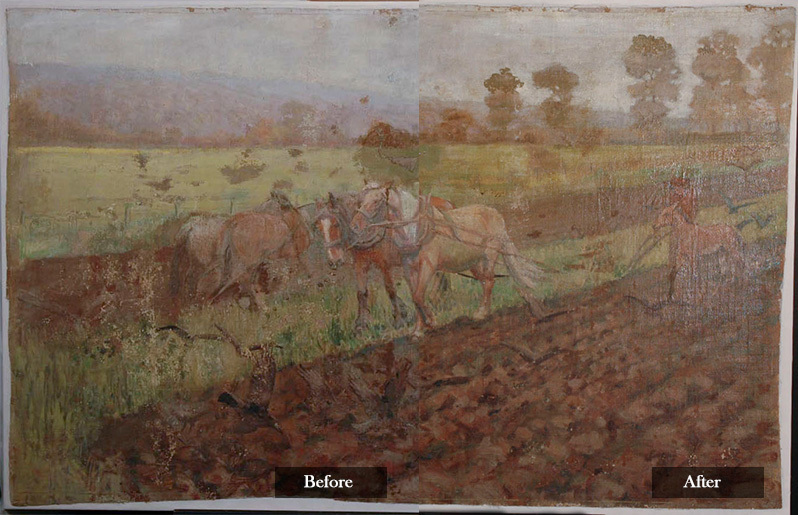 Professional conservators have now been called in to assess the work and see if it is possible to restore the fresco. This unfortunate incident has created a flurry of attention and opened an important discussion about art conservation. Incidents like this occur all too often because untrained people attempt to restore a piece on their own. After all, the internet is full of articles on how to DIY. There are products sold that will magically take away years of grime and discolored varnishes making a painting look like new. 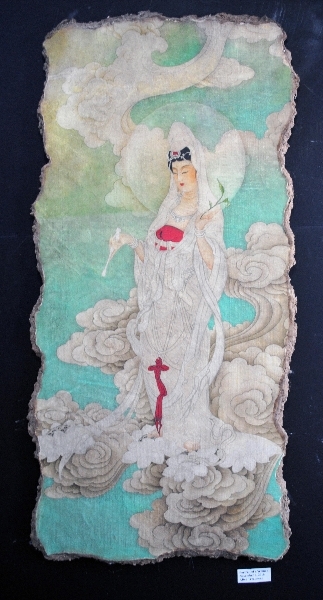 Unfortunately, without proper training, it is easy to damage a painting beyond repair. One good thing has come out of Cecilia’s attempt to lend a helping hand. It has cast a strong light on the importance of professional art conservators. 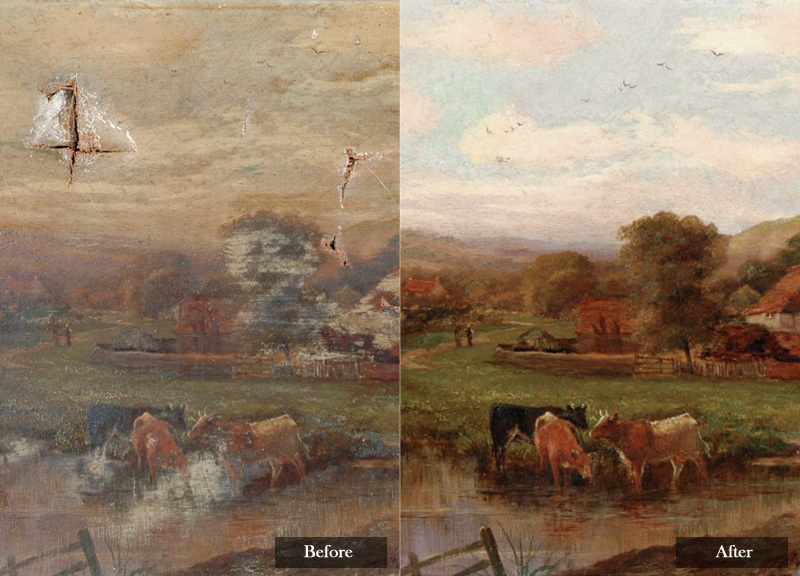 Always get advice from a professional conservator about restoring your artwork. Thanks to Cecilia the world now understands the dangers of restoration attempts by an amateur. Great blog. I’m headed to Italy in late September. I am looking forward to the art and architecture from Rome to Florence. Best of luck on your blog and adventures in Art. Glad there are people like you out there to make sure these great pieces of art are taken care of! Great story. Hopefully more people understand the importance of working with a professional. Great reminder of the risks of DIY projects. Amazing Blog!! Definitely takes a specialist to maintain our treasures and this is a good example of why! !